This report is about Marketers can create social networks to deliver better engagement and business results with branded, owned online communities. n the business environment that dominated the past few decades, successful marketers helped drive business value by demonstrating proficiency in customer acquisition and lead conversion. In the digital era, however, top marketers help their brands reap the business value of using branded social networks to drive enhanced customer engagement/experience. The business value of branded social networks comes from the simple idea that forward-looking brands should reimagine their businesses as social networks of customers, fans, partners and many stakeholders who share an enthusiasm for the brand and thus provide the essential elements of a top-performing, revenue-generating brand. For more information about this report, you con find it here. Social commerce is the addition of shopping to social networks. Small business can profit from Facebook Commerce. But if businesses aren’t careful, social commerce has the potential to ruin social networks. That’s why it’s important how brands fulfill on f-commerce. It will directly affect the success not only for their own individual brand, but as an industry as a whole. If social networking shopping sites are not delivered in the spirit of what the customer wants, it will fail. If they are delivered well, social commerce can succeed. If not for this point alone, brands need to pay attention to f-commerce as an example of how shopping can be integrated within a social network. An example of someone who really gets social commerce? That would be Rachel Roy. Rachel used a pop-up store— a Facebook commerce store to create engaging social merchandising experiences that increase a brand’s fan base while driving transactions. By creating immersive brand experiences that fully integrate shopping as well as the shopper’s wider social network, the brand increased their social currency with those fans and customers. And a pop-up shop is a great way for brand to test the f-commerce waters without going into full-scale shop. Rachel Roy launched a pop-up store on Facebook, giving fan’s a shopping event that included early access to Roy’s new jewelry line which was a collaboration with British R&B artist, Estelle. Rachel Roy provided a limited edition, time sensitive offering that helped drive sales without having to offer a discount. The pop-up store lasted three days and boosted Rachel Roy’s fan base by 25% in the first day and 100% by the end of the campaign. The Facebook Page acquired 1 fan every 1.5 seconds. The exclusive, limited edition piece sold out in six hours. The Rachel Roy pop-up shop was built on a software-as-a-service solution created by Fluid Social Fan Shop of the Fluid Agency. This is an e-commerce firm whose clients include Diane von Furstenberg, Nine West, Theory, Vans and Coach. 6 hours: Time it took for the Rachel Roy Facebook jewelry store to sell out. 3rd highest: daily sales made by Rachel Roy, the day it opened its pop-up f-store. Bravo to Rachel Roy for being a social commerce diva!! You can find more examples like this in Dr. Natalie’s Book: Like My Stuff: How To Monetize Your Facebook Fans With a Facebook Store and learn how to use social commerce for your business! Top Social Commerce Statistics from SocialCommerceToday.com – You Can Monetize Facebook Fans! 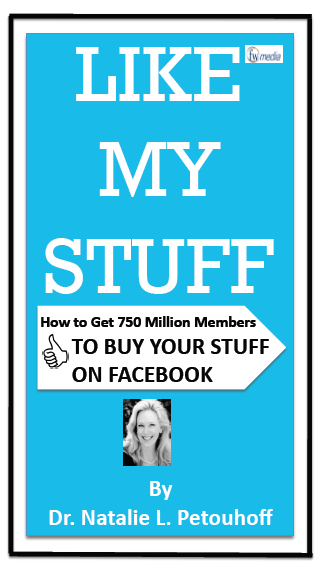 When I was writing the book, Like My Stuff: How to Monetize Your Facebook Fans with a Facebook Store, many people said they didn’t know that you could make purchases on Facebook. As I was doing research for the book, I came across a site, SocialCommerceToday.com that has the most amazing collection of information on social commerce and f-commerce. Below is an excerpt of what they offer! These facts could be the key to getting your Facebook initiative approved and monetized! Could Facebook Be the Operating System of the Future? 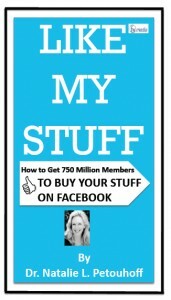 For more information on my book about F-commerce, “Like My Stuff: How to Monetize Your Facebook Fans with a Facebook Store” check out my Facebook store. Description: Chapter: Show us the money! I will be covering the long awaited secrets to how to measure ROI for social media! In this interview with Esteban, we look the necessity of analytics on social CRM. Pretty much you get what you measure. Esteban told me that his opinion on whether companies will truly become “social” depends upon their ability to collect, analyze and implement social feedback- from both employees and customers. Most of the feedback in the social cloud is unstructured. So then the question becomes how does a company make sense of this unstructured data cloud? The business value of adding social customer interaction feedback to your company.